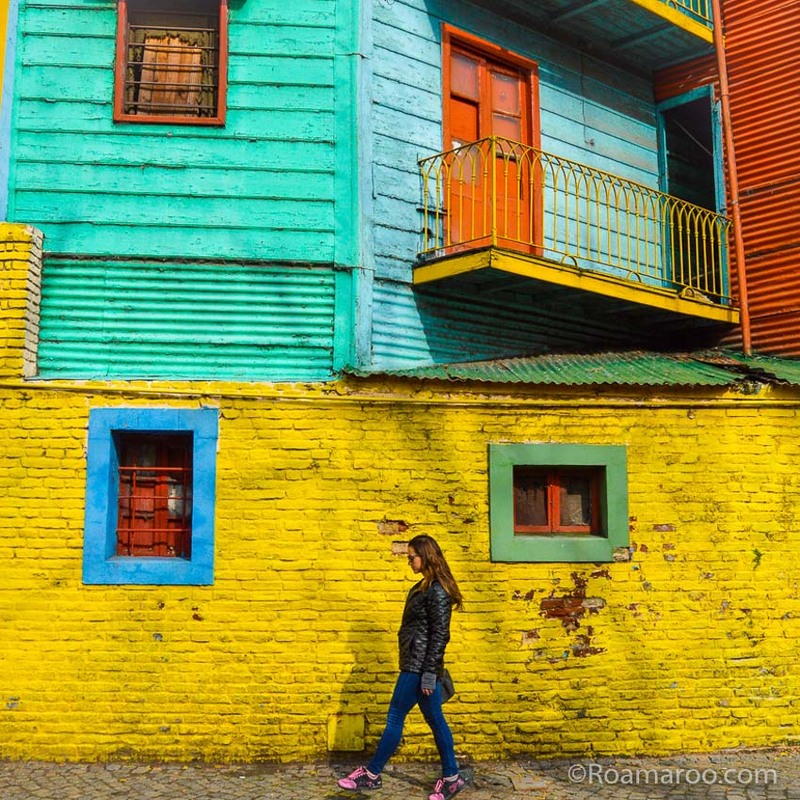 As part of a two-part series I have asked various travel bloggers to provide their top suggestions on where you should visit in South America. You can use the menu below to jump to the different sections. The Iguazu falls were one of my favourite places to see in South America – they’re an absolute must visit if you find yourself in Brazil or Argentina. When Eleanor Roosevelt saw them for the first time, she famously uttered ‘Poor Niagara!’ as apparently the majesty of Iguazu put Niagara to shame. I have never been to Niagara but I can guarantee that Iguazu is truly one of the world’s greatest natural wonders. 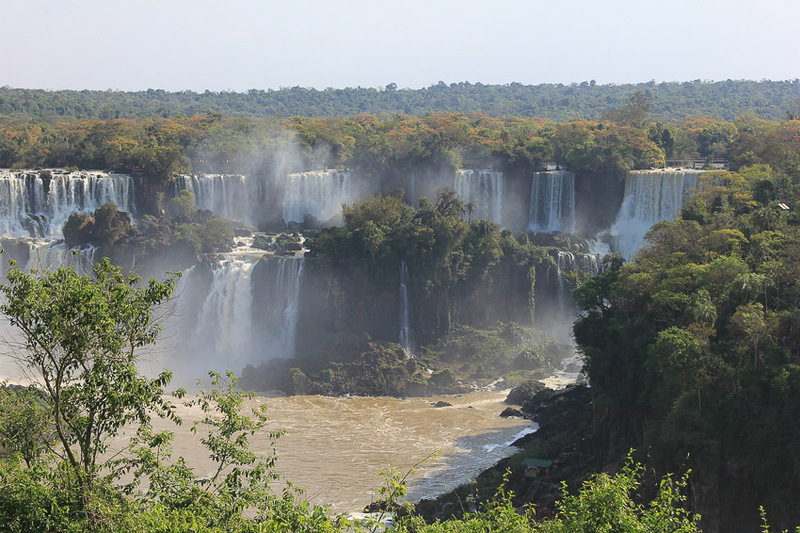 The falls are located on the border between Brazil and Argentina and can be visited from both countries. Brazil offers the grand overview, with opportunities to take some cool panoramic shots, whereas Argentina allows you to get close to the falls themselves – don’t forget a water poncho as you’ll get soaked for sure! There are dozens of fun activities you can enjoy near Iguazu falls, including boat trips through the rainforest, abseiling, canopy tour and night safaris! Buenos Aires is a feast for your senses, literally and figuratively. When visiting the capital of Argentina, it’s absolutely necessary to take a date night to one of the local parrillas or steakhouses. We recommend noshing on lomo (tenderloin) and washing it down with a local Argentinian Malbec from Mendoza. Buenos Aires operates late so don’t go to dinner until at least 9:30 or you’ll stand out as a tourist! The best steakhouses to visit are Don Julio, Miranda, and La Cabrera. As a couple visiting Buenos Aires, an evening at the Teatro Colon opera house is an absolute must. Argentina is known for its fabulous Malbec wine and there are thousands of places to enjoy it. You can visit one of the many wine-tasting rooms or simply pick up a bottle at a bodega and enjoy it on your own. While Buenos Aires is known for its spice, it also has a sprinkling of everything nice. The Alvear Palace Hotel in the elegant Recoleta district hosts an afternoon tea fit for a queen. Buenos Aires is a nocturnal city, with its inhabitants known to party well after the sun comes up. Take a tango lesson in the day and then head to a milonga at night to test out those Argentine dance moves. When you are visiting the north of Argentina (maybe on your way to Iguazu Falls, on the border with Brazil), try to allow for a stop at Iberá Wetlands. 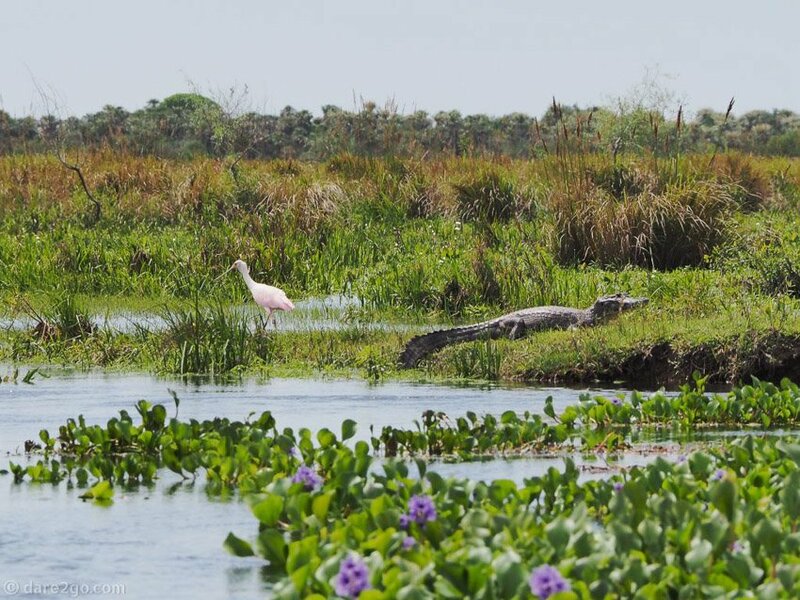 These are amongst the largest wetlands in the world, second only to the Pantanal in Brazil. Not only are these wetlands an important source of water, but they also provide refuge for a large variety of wildlife. Of nearly 20,000 km2 over 13,000 (5,000 sq mi) are a protected reserve. 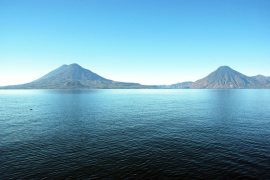 The community of Carlos Pellegrini acts as a guardian for these waters and tries to make a living from low-impact tourism. 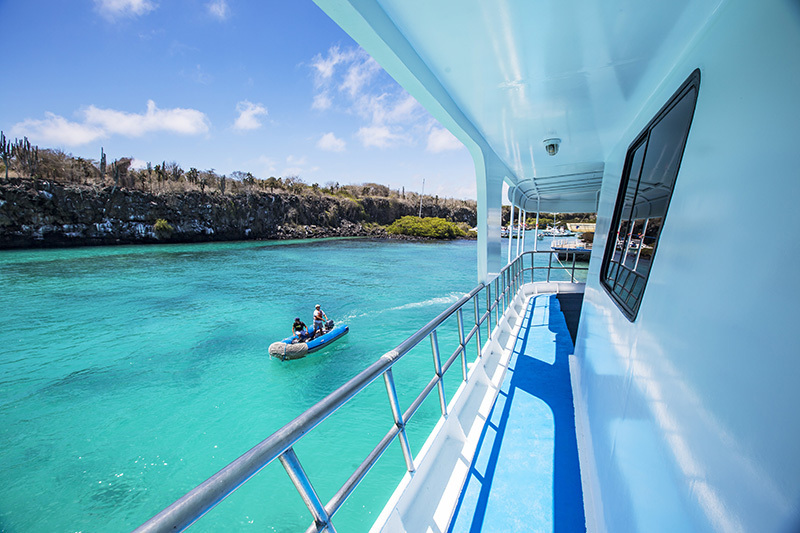 You can go on boat tours, night walks, and join in a number of other activities. We hired a boat with another couple and went on a slow trip to explore. All of us were amazed by the wildlife we were able to watch, often assisted by our gentle local guide who just seemed to have an eye for spotting animals. We saw caimans, capybaras, marsh deer, and hundreds of exotic birds, among them pink spoonbills and colourful kingfishers, just to name a few. We have since been to the North Panatanal in Brazil and we rate our experience at Iberá higher. Unlike the Pantanal, the Iberá Wetlands are reasonably easy to reach. The best access is from the town of Mercedes in Corrientes province. You can take a local bus, or an organized tour, to the small village of Colonia Carlos Pellegrini. In that town, you will find accommodation for various budgets, small shops with basic provisions, and several eateries. We preferred to stay at the lovely municipal campground on a small peninsula jutting out into the lagoon – a perfect spot for hummingbird and sunset watching. If you’re up for a digital detox, look no further than Cabo Polonio. 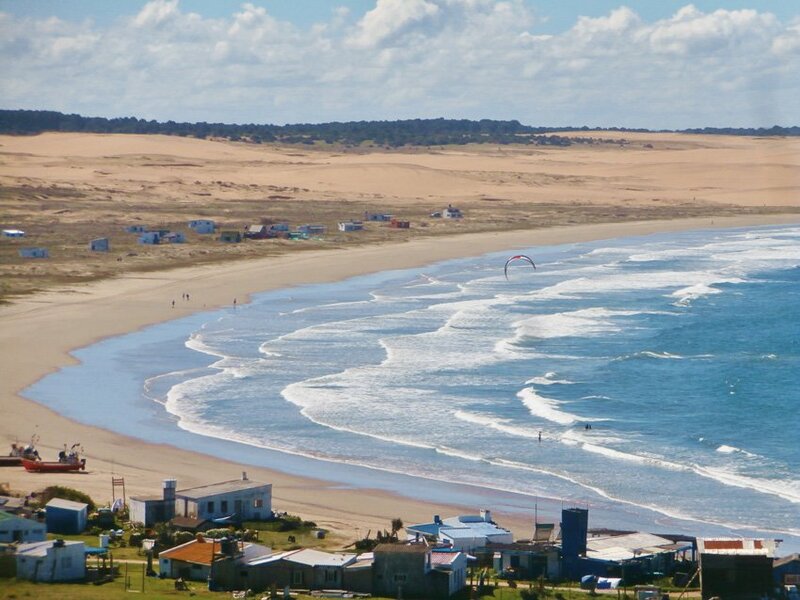 At the Atlantic coast in Uruguay, there’s a bunch of sandy trails leading to the cape. Once you’re at the cape, you’re without electricity, running water or plumbing. Back to the basics. The only way to get in and out is by a 4WD bus with impressively high clearance, or on foot. So what’s exactly the appeal? The landscapes are marvellous and it’s the best place to clear your head. Take barefoot walks on the beach. Meditate in the sand dunes. Catch up on sleep and attune yourself to your circadian rhythms. Refresh yourself in the ocean. Watch the fat-and-happy sea lions be themselves on the rocks. Catch a whiff of legal marijuana carried on the wind. If you bring more than enough cash, you can go kitesurfing, shop artisanal crafts, eat out, and climb up the lighthouse for some ace views. Whatever it is you choose to do, apply sun cream beforehand; there’s an ozone hole in the southern hemisphere. Die-hard urbanites will loathe Cabo Polonio, so please ask yourself if you can handle it for longer than a day. To make the switch a little more comfortable, bring a book, power bank and torch to light your way. At the town, there’s several hostels and cabins for rent. For camping, you’ll have to bring your own gear. And don’t worry about looking like a seasoned hippie; you’re in the majority. The Atacama is said to be the world’s driest desert. The charming town of San Pedro de Atacama, situated right in the middle, is a 24-hour bus ride from Santiago de Chile, or a two-hour flight to Calama, followed by a two hour trip by road. But it’s worth the journey. From here, you can discover the desert’s secrets during the day and go stargazing at night-time. 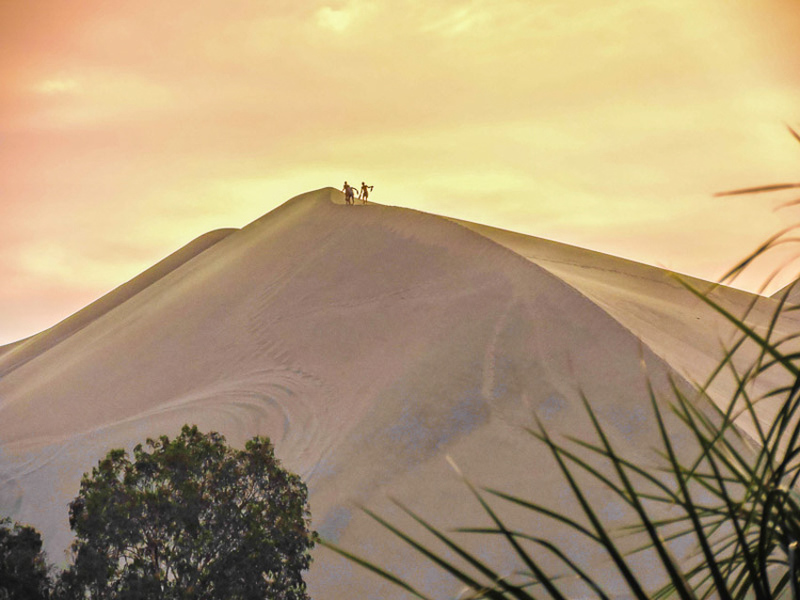 Don’t miss a visit to the Valley de la Luna, where adventurous types can go sandboarding on the soft sand dunes. You get full tuition and it’s good fun – even for non-sporty people like me. You can go at quite a speed and if you fall down, it doesn’t hurt! Deep among Valley de la Luna’s beautifully desolate lunar landscape, with its mile-wide craters and mountain peaks, you will find the glittering salt caves. With walls covered in a frosting of salt scales, they tinkle like a piano when stroked with your fingertips. At night time, take advantage of the desert’s clear, unpolluted skies with an evening of stargazing at one of the area’s observatories. Knowledgeable hosts point out the constellations and bring to life our understanding of the universe. Then, peer through the giant telescopes and you will see the stars close up, like you’ve never seen them before or could have possibly imagined. There are many other natural wonders to see around San Pedro de Atacama, including lagoons, hot springs and flocks of wild pink flamingos – so if you’re in Chile you won’t regret making an expedition into the desert. Torres del Paine National Park has some of the most spectacular landscapes I have ever seen and possibly in the world. Located at the southern tip of the Andes, in Chilean Patagonia, it is a wild environment with rugged mountains, lakes, rivers and glaciers, and it has a pretty unique wildlife. It is the home of the elusive puma, and the ubiquitous guanaco, which can be found grazing along the tracks. Despite being extremely remote, it is one of the most visited parks in Chile. 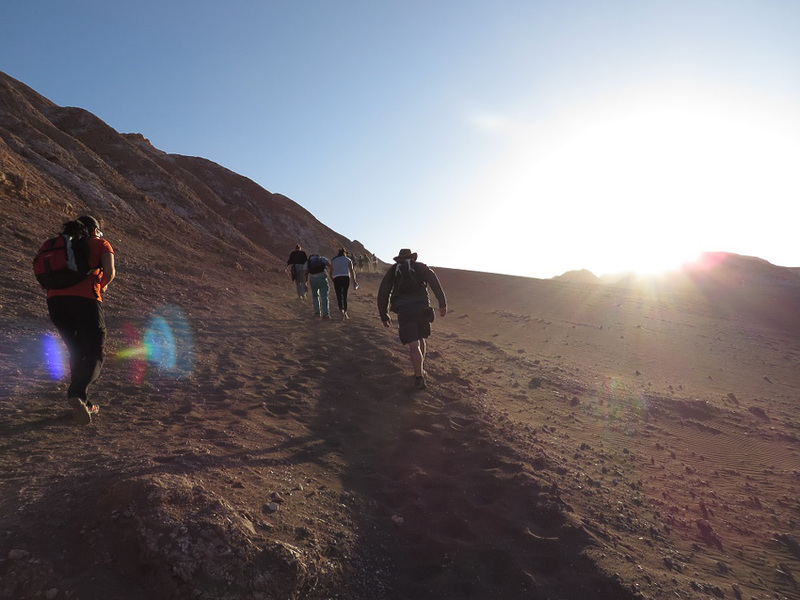 Visitors come to the park for the trekking, which can be really challenging but so worth it! There are two long-distance route options, with a network of refugios that provide shelter and basic services along the way. The W Circuit is considered to be among the world’s top treks in the world. It takes about 4-5 days and is the most popular multi-day option. You can see most of the highlights of the park on this route, including the Mirador de las Torres and the Valle Francés lookout. The longer options is the O Circuit, which is the full loop around the Cordillera del Paine and takes 6 to 10 days. This route is approximately 110kms long and challenging and will require camping, but it is easy to stock up on supplies along the way. Whichever route you choose, you are guaranteed to be blown away by the magnificence of this place. Located in the Venezuelan Gran Sabana, Angel Falls is a sacred place for the area’s natives. At 979 meters high, it proudly boasts of being the highest waterfall in the world, and it is, without a doubt, the country’s biggest tourist attraction. However, if we take into consideration the fact that we’re talking about Venezuela, even the most famous tourist attraction is not touristy at all. You can enjoy this wonder of nature while being there almost by yourself! 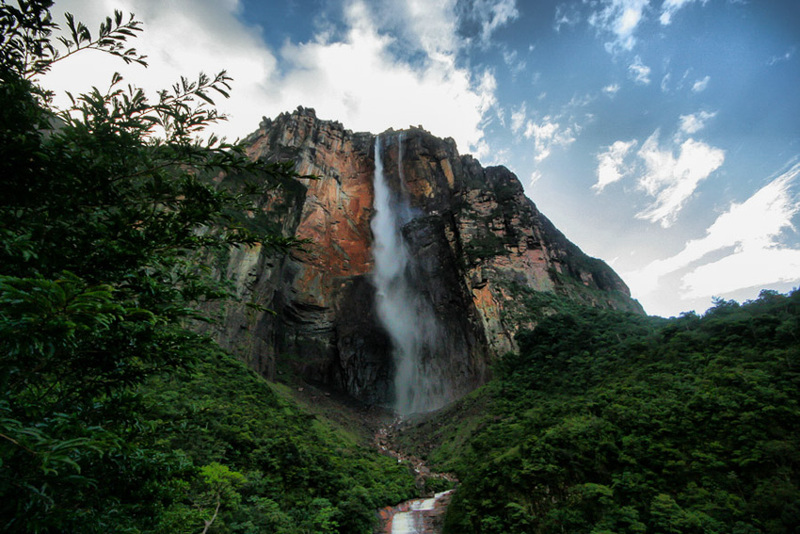 To get to Angel Falls, you’ll have to fly to Canaima Park because there are no accessible roads. The region is also known as Gran Sabana and borders Brazil and Guyana. It’s a beautiful place full of tepuys and rivers. Tepuys are table-shaped mountains that create surreal landscapes of endless waterfalls cascading from the rock cliffs. Inscribed on the UNESCO World Heritage list in 1994, this park is one of the most beautiful places in the world. Seriously! Once in Canaima, you can take a three-day tour during which you will visit other spectacular waterfalls before navigating up the Carrao River to admire the majestic Angel Falls. I suggest that you don’t miss the overflight because it gives you the best views of the Angel Falls, right from above. I paid around $25 for the overflight! It’s worth it, and really cheap! Many Table Mountains (tepuis) are scattered over the grasslands of The Grand Sabana area in Venezuela. These tabletop mountains are considered to be some of the oldest geological formations on Earth. The tallest of these, Mount Roraima, is the highest of South America’s Pakaraima Mountains. 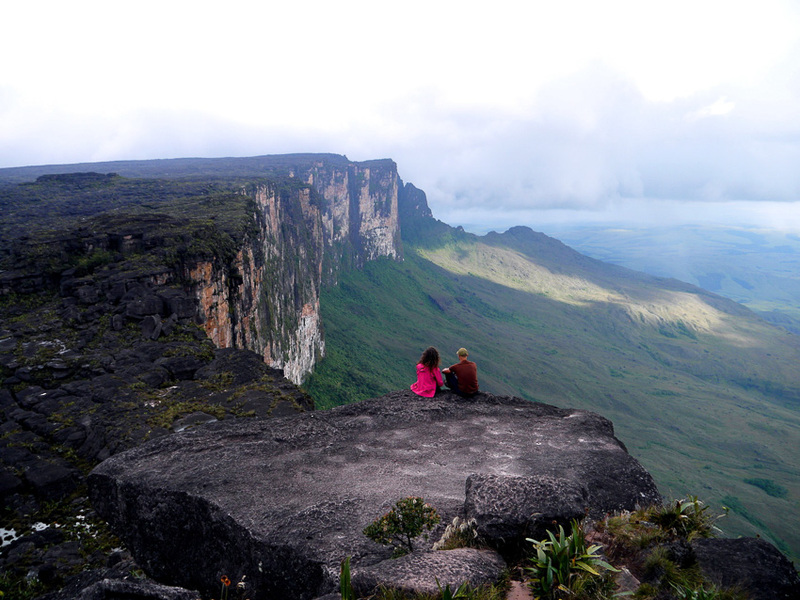 The large square summit area of Roraima is defined by tall vertical cliffs. Extraordinary rock formations, quarts fields, insect-eating plants and many high waterfalls cover the breath-taking summit area. This spectacular mountain has been an inspiration to writers and movie makers. It is thought to have inspired Arthur Cone Doyle’s book ‘The Lost World’, published in 1912 and more recently it was the setting for the animated Pixar movie UP. Trekking Mount Roraima is a must do for all adventure and hiking lovers, it is a unique place with unreal scenery. There are some unique fauna and flora on each of the tepuis since species have developed in complete isolation on top of them over thousands of years. We explored the spectacular 31-square-kilometre summit area for 3 days, with mind-blowing views from the 400-meter-tall cliffs on all sides. The top of the mountain is shared by three countries; Venezuela, Brazil, and Guyana and can only be hiked from the Venezuelan side. About halfway between Cusco and the famous city of Machu Picchu lies a place that not only features incredible Incan ruins but has a history even greater than its better-known neighbour. 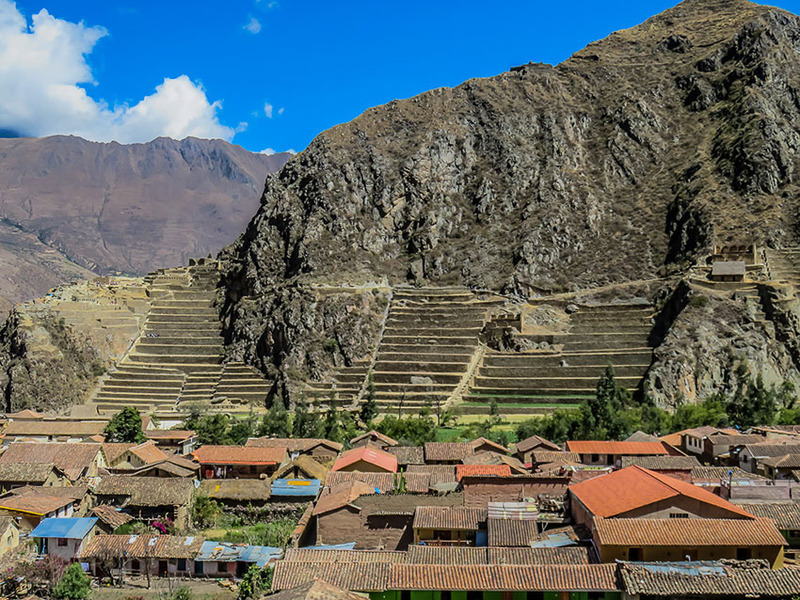 This is the village of Ollantaytambo and it deserves your attention. Cobblestone lanes that have seen over 500 years of Incan history crisscross the small residential area. The houses that once sheltered the followers of the Emperor Manco Inca now are the homes of their descendants, and little has changed. The two archaeological sites here, the storehouses of Pinkuylluna and the great Citadel, give us a glimpse into the engineering and masonry skills in use 500 years ago. But his place holds a high place in Incan history as the site of a rare defeat of invading Spanish armies. For it was here that 30,000 Inca, led by the emperor himself, repelled the might of Pizzaro and his army before he returned with a massive force that spelt the end for Manco Inca. This is a town that has everything a traveller could desire, history, culture, cheap lodging and great food. It is a place you need to visit. The Lares trek is a fantastic alternative to the Inca Trail in Peru. The views on this 3-day Andean mountain trek are just stunning in every direction and it’s so remote that it’s just you, a small team and the occasional farmer or llama! You will pass by snow-capped mountains, rolling hills, small villages, gushing waterfalls, rivers and if you’re lucky you may finish up at some hot springs near Lares village depending which end you start from! It’s not the easiest of physical challenges mostly due to the high altitude – it reaches 3800M! And you will scale a couple of mountains! But it is most definitely worth it when you see the view from the top! Whilst the scenery is a little different to the Inca trail (less rainforest, more remote mountains,) the main attraction of the Lares trek is how quiet it is – no constant streams of tourists! The villages you pass through are more authentic and when you camp, it’ll be just you and the countryside! You will still get to see Machu Pichu on your 4th day but after a restful night’s sleep and a beautiful train ride. I did the Lares Trek with Gadventures, a company I’ve used previously and trust. The standard of service was phenomenal from the chef’s 3-course feasts to the quality tents and supportive guides! I wouldn’t hesitate to recommend them. 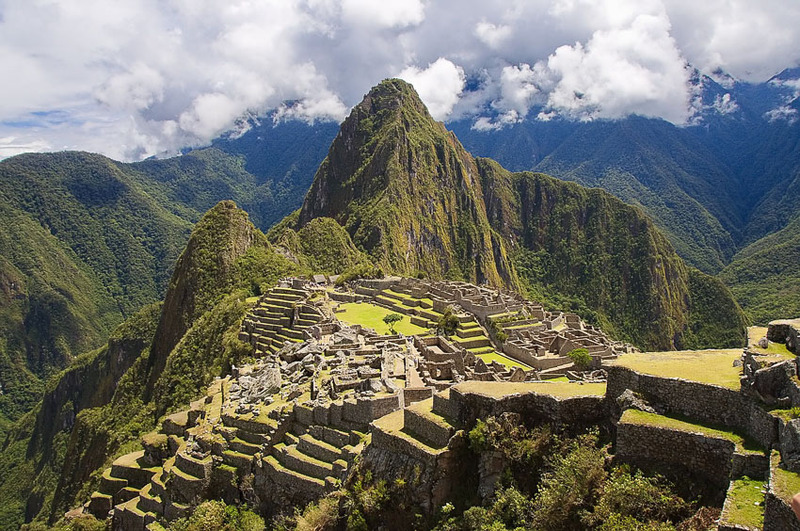 Undoubtedly the most famous landmark in South America, Machu Picchu is not to be missed. Yes, it is touristy, but this Inca citadel was named one of the ‘Seven New Wonders of the World’ for good reason. The Spanish conquistadors never found their way here, to the city built high on a mountain surrounded by dense jungle. Once the Inca empire fell, nature reclaimed the ruins, which remained relatively intact without suffering the looting and destruction so common among other Inca sites. 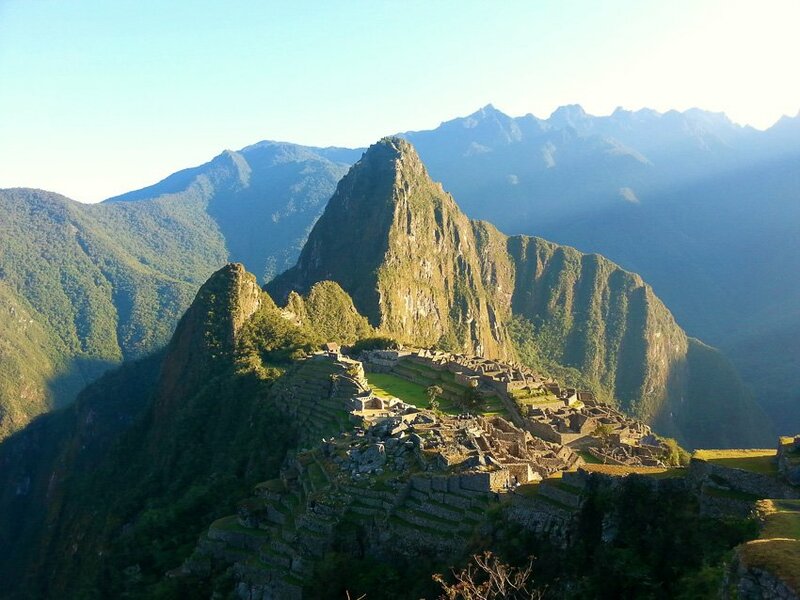 Since its rediscovery in 1911, visitors continue to be amazed by Machu Picchu’s beauty. Located in the Inca’s ‘Sacred Valley’ in southern Peru, most visitors to Machu Picchu choose to take a three-day trek through the mountains to reach the ruins. The gruelling Inca Trail is one of the routes the Incas took to reach their hidden citadel, and is extremely popular, usually selling out months in advance. Other routes like the Salkantay trek reach over 4000 metres in elevation, through snowy mountains and incredible scenery, or the Inca Jungle Trek includes zip lines and rafting to help you reach your destination. Alternatively, you can take a train from Cusco to Aguas Calientes at the base of the mountain, and then a bus to the entrance, so don’t fret if you’re not at peak fitness! Once when you finally reach Machu Picchu, you’ll understand why it is worthy of such a title. As the morning mist clears, and the first rays of sunshine touch the tops of the temples, Machu Picchu will captivate all who gaze upon it. Cordillera Blanca is one of the biggest mountain ranges in the world with most peaks above 6,000 meters. Visiting Peruvian giants is a trip of a lifetime. Cordillera Blanca and Cordillera Negra mountain ranges in Peru used to be one range before they were sliced in two by Santa River. While Cordillera Negra doesn’t have any snow and stays warm from the Pacific Ocean, Cordillera Blanca has constantly snow-covered peaks. Huascaran National Park in Cordillera Blanca is becoming a popular area for outdoor lovers and is well known between climbers. 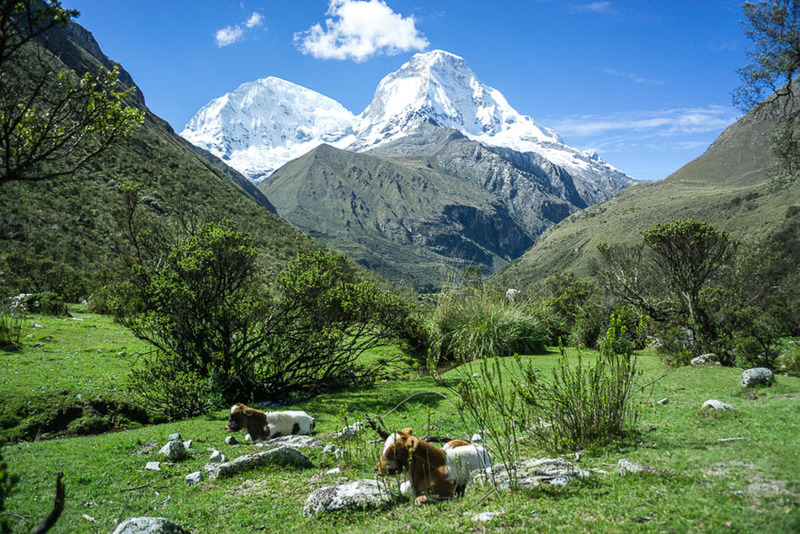 An important thing to keep in mind when visiting Cordillera Blanca is the altitude. The main hub, the city of Huaraz, lies at an elevation of 3,050 meters above sea level. It is essential to acclimatize for high altitude before attempting any activities. Most of the hikes and treks in Cordillera Blanca reach at least 4,500 meters. After a few days in Huaraz, an ideal acclimatizing day hike for even higher altitudes is Laguna 69 – the bluest lake in Peru. Then the options are endless. We chose to do Santa Cruz Trek, a 4-day trek through the mountain pass Punta Union at 4,750 meters. 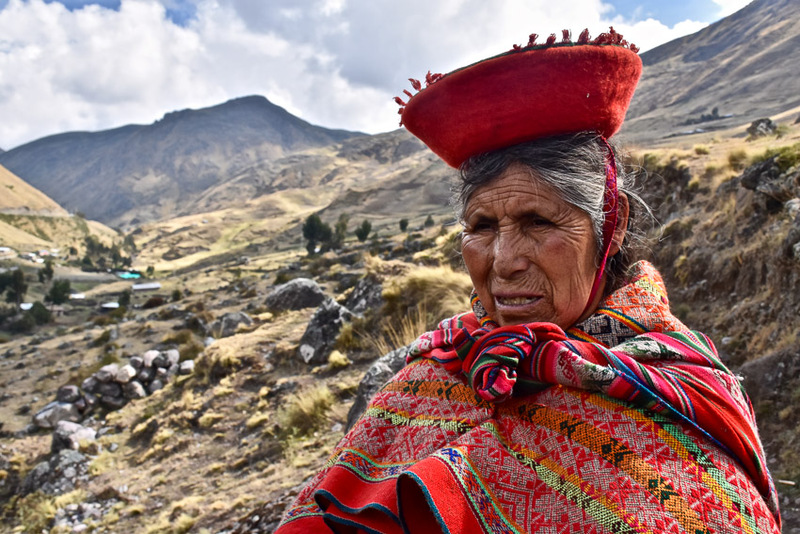 Passing small mountain villages and observing the life of locals is a great way to experience the Peruvian culture. A real treat offered in Cordillera Blanca is mountaineering for beginners. Climbing Nevado Mateo at the altitude of 5,150 meters is a challenging day trip and a great introduction to mountaineering. And that is only a little taste of what Cordillera Blanca has to offer. 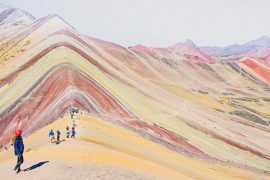 If you’re interested in visiting, I encourage you to read our guide about this Peruvian outdoor heaven on our website. Huacachina in South America is an incredible sight. This Peruvian town is surrounded by glorious sand dunes and as the sun sets locals and holidaymakers relaxing by the lagoon can hear the screams and laughter of backpackers taking the ride of their lives in the back of the 4X4. Sledging, boarding (and for the more adventurous), skiing are the main attractions in Huacachina but you can forget falling on icy snow, you are fleeing down sand! Huacachina sandboarding tours typically include attempting to board down the dunes then a bumpy yet exhilarating drive up and down the hills. Huacachina is also a lot of fun as darkness falls, ever partied in a lagoon? Most backpackers head to Huacafuckingchina for cocktails and local entertainment then on to Casa de Arena for some dancing (weekends). The best stop for lunch and smoothies is Bananas Adventures hostel, this place also has a swimming pool to help soothe the hangover. Huacachina is small, the next biggest town is Ica where you will find supermarkets, banks with ATMs and real life. Read more about Things to See and do Peru. Do you have any other suggestions on places to visit in South America? If so please leave a comment below. You will find various other suggestions in the first part of this series and you can use the menu below to navigate there. 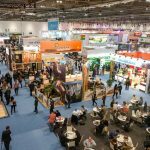 Hey Buddy!, I found this information for you: "Top Places to Visit in South America – Part 2". 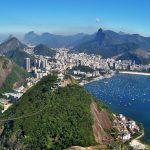 Here is the website link: https://www.travelanddestinations.com/top-places-to-visit-in-south-america-part-2/. Thank you.